Whilst involved in a battle earlier in the race, Fenati was run out onto the gravel by Stefano Manzi. 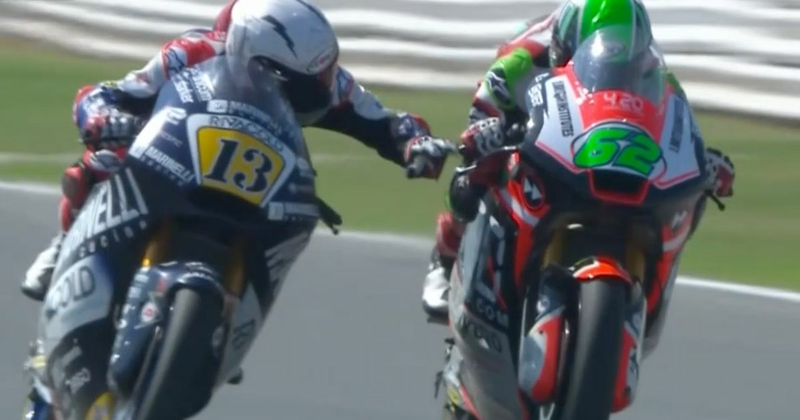 That’s fairly standard stuff in a championship as competitive as Moto2, but Fenati decided to deal out his own brand of justice. Not by recovering, beating him in the race, and then complaining to the stewards after the race, but by catching him up and then reaching over and squeezing the front brake lever of Manzi’s bike. No, really. Update: Fenati has been banned from the next two races in Aragon and Thailand.